The best book for getting started with Android. Let’s say you have decided to learn a new platform. You start reviewing hello world tutorials and searching for the best books on the subject. You spend some time reading reviews of the top rated books on Amazon. Perhaps you narrow down your choices to a short list of two or three books. Which one should you buy? Your time is limited and you are not looking to start a library of books that will just take up space on your shelf. Does this sound familiar? If you click over to the website for The Busy Coder’s Guide to Android Development, you are going to start seeing information about The Warescription. The book itself is delivered as an eBook when you buy a one year subscription. You may be thinking do I want a subscription to a technical book? The answer is yes. Yes you do. The truth is when I started writing my first Android App, I bought a hard copy of a highly rated book from Amazon. This book was a good introduction to Android. The problem was that it was out of date by the time the UPS man delivered it to my door. The Android platform is under active development. New versions of Android are being shipped multiple times a year. Mark Murphy has you covered. He actively monitors the changes that Google is making to Android through articles like this. Then he releases a timely update to his book. You may be old enough to remember when thick technical tomes came with a CD with example code inside the cover. These CDs were a nice addition to the book and could save a lot of typing. One of the benefits of The Busy Coder’s Guide to Android Development is all the code samples it comes with. Of course, these days the code samples are hosted on github. The code samples are concise and illustrate the points being made in the book well. It is helpful to be able to read about the concepts from the book and then to be able to see a working example. You can then explore the source code in the context of the background material from the book. There is a saying that applies to The Busy Coder’s Guide to Android Development. Price is what you pay, value is what you receive. If the frequent updates and extensive code samples haven’t convinced you of the value of the Warescription, just wait there is more. The more in this case comes in the form of office hours. The office hours take place in an online group text chat session. If you have specific questions, Mr. Murphy is available to answer them during office hours. I appreciate physical books but when it comes to technical books, I am sold on the eBook format. The PDF format of Version 6.3 of The Busy Coder’s Guide to Android Development tips the scales at 2987 pages. The Android platform is huge. No single book could cover every detail, but this book covers a lot of ground. I wouldn’t want to carry around a paper version of the full book, but I have printed out relevant chapters here and there. The book also comes in epub, mobi and APK formats. I most often use the PDF format and the APK format. It is nice to have the PDF book open in a separate window while working on code. The APK format is nice to read on a tablet when you don’t want to take up extra space on your monitor. The Busy Coder’s Guide to Android Development is a perfect fit if you are going to be building an Android App as a side project. By definition you don’t have unlimited time to dedicate to your side project. Between the writing in the book and the sample code, this book will get you up to speed quickly. The updates that are published will cover what you need to know about up and coming versions of the Android platform. Mark Murphy has truly over delivered on this book. Take a look at the graph of total paid Android App installs below and see if you can guess which of the paid Apps competes with several free alternatives? 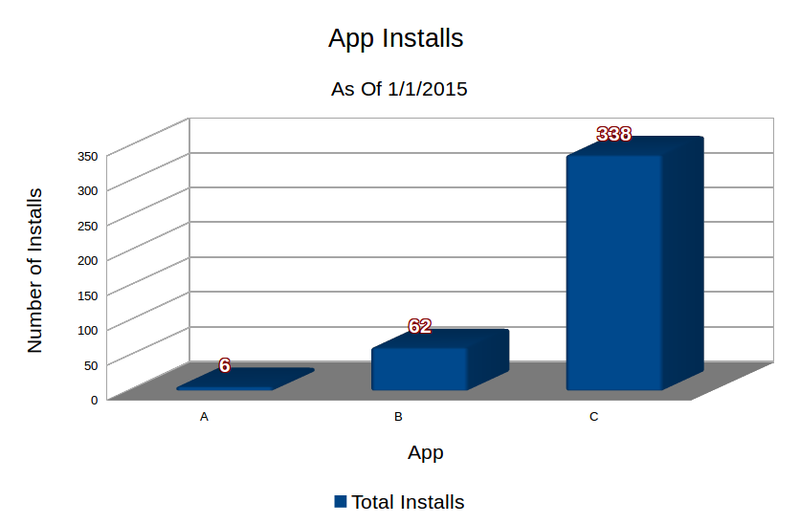 Total app installs for three paid apps after two years on the Google play store. For bonus points, which App was made based on a request from an Android user on an Android forum? The answer to the first question is A, also known as Eco Trip, a gas mileage calculator. 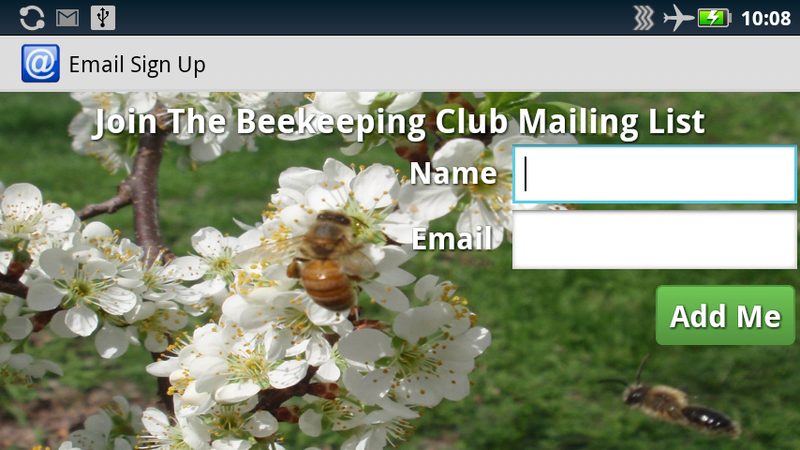 The answer to the second question is C, also known as Email Sign Up, an App that collects email addresses. For completeness, B is Eggspense, an App to track costs associated with keeping chickens. As it turns out, making a paid App that people want is non trivial. The best way I have found is to do research with the goal of making something that people are already asking for. Chances are that if one person on an Android forum is requesting the App, there are other people who are likely to want it as well. Eco Trip was the first App that I made. I had to pick something to build as a first App. I chose to make a mileage calculator because I keep a paper mileage log in my car. I am good at writing down the mileage each time I fill up the tank, but I rarely bother to calculate the actual miles per gallon. I thought, why not make an App that would log the mileage and automatically calculate the miles per gallon? Eco Trip was an App that I knew I would use. Once I had decided to build the app, I focused on building the first version. As development of the App was coming to completion, I decided to check to see if there were any other similar Apps already on the App store. I was disappointed to see that there were a few free alternatives already available. I pushed through this set back to complete Eco Trip. The App has received very few downloads and I quickly lost interest in adding features to it. Email Sign Up is designed to replace paper email sign up forms. The idea came from the following forum post (source). I run a college club. We go to events and people sign up for our mailing list. When I get home, I add them to the club email account, and I have to throw out half of them because people can’t write worth a damn. People enter their name. They enter their email address. They press “Add Me”. Their name and email address are dumped into a text file. The text file would have the date for a name, and anyone logged that day would be added to the end of the text file. I’d still want to import them manually so the occasional moron trying to be funny won’t clutter up our email address book. It would also be nice if you could customize the background for your organization. This would literally take someone a half hour to make. I just don’t know anyone who knows how to do it. The first version of Email Sign Up matched this description almost exactly. Check out a screen shot from an early version of the App below. An early version of Email Sign Up. I added emphasis to the poster’s time estimate. Estimating how long a software project will take is incredibly difficult (books have been written on the topic). It is even harder for non software people. It took quite a few late nights spread across a couple of weeks to complete the first version of the App. The main challenge of making Email Sign Up was allowing users to choose an image file. The heap on Android devices can be as low as 16 MB. When allocating space to hold an entire high resolution image, you can quickly run out of space. When this happens Android will force close the App. Not a good user experience. The solution is to scale the image. The image doesn’t need to be any larger than the devices screen resolution.